- NJPW Sumo Hall (February 16, '97) = Fujita & Shinjiro Ohtani were beaten by Tatsuhito Takaiwa & Yutaka Yoshie. - NJPW Budokan Hall (June 5, '97) = Fujita lost to Kendo Kashin. - NJPW Sumo Hall (August 1, '97) = Fujita & Takashi Iizuka defeated Kendo Kashin & Tatsuhito Takaiwa. - NJPW Sumo Hall (August 2, '97) = Fujita was forced to submit to Don Frye. - NJPW The Four Heaven (August 10, '97) = Fujita forced Kendo Kashin to submit. - NJPW Three Gun Tag-Team Tournament (September '97) = Fujita & Takashi Iizuka lost in the first round to Junji Hirata & Osamu Kido. Kensuke Sasaki & Kensuke Yamasaki won the tournament. - NJPW Budokan Hall (September 23, '97) = Fujita fell to Don Frye. - NJPW Final Battle Hall (November 2, '97) = Fujita & Takashi Iizuka took down Kendo Kashin & El Samurai. - NJPW Power Hall In Tokyo Dome (January 4, '98) = Fujita was pinned by Riki Choshu. - NJPW Budokan Hall (February 15, '98) = Fujita lost to Tadao Yasuda. - NJPW Inoki's Final Opponent Tournament (March/April '98) = Fujita lost in the first round to Igor Meindert. Don Frye won the tournament. - NJPW Budokan Hall (June 5, '98) = Fujita fell to Satoshi Kojima. - NJPW Sumo Hall (August 1, '98) = Fujita & Junji Hirata defeated Takashi Iizuka & Osamu Kido. - NJPW Sumo Hall (August 2, '98) = Fujita was taken down by Takashi Iizuka. - NJPW Rising The Next Generation (August 8, '98) = Fujita & Yuji Nagata were beaten by Satoshi Kojima & Manabu Nakanishi. - NJPW Wrestling World '99 (January 4) = Fujita fell to Manabu Nakanishi. - NJPW St Valentine's Day Massacre (February 14, '99) = Fujita, Yuji Nagata, & Manabu Nakanishi beat Tatsutoshi Goto, Kuniaki Kobayashi, & Michiyoshi Ohara. - NJPW Strong Style Symphony (April 10, '99) = Fujita & Kazuo Yamazaki defeated Alexander Okutsu & Yuki Ishikawa. - NJPW Battle of Last Summer (August 28, '99) = Fujita forced Brian Johnston to submit. - NJPW G-1 Climax Tag-Team League '99 (September) = Fujita & Kensuke Sasaki competed in the league, which was won by Keiji Mutoh & Scott Norton. - NJPW Budokan Hall (September 23, '99) = Fujita & Junji Hirata lost to Takeshi Iizuka & Osamu Kido. - NJPW Final Dome '99 (October 11) = Fujita forced Sean McCulley to submit. - NJPW Wrestling World '00 (January 4) = Fujita lost, via DQ, to Kimo. - Pride Heavyweight Title Grand Prix '00: First Round (January 30, '00) = Fujita forced Hans Nyman to submit. - Pride Heavyweight Title Granx Prix '00: Final Rounds (May 1, '00) = Fujita won, via unanimous decision, over Mark Kerr, then fell to the eventual winner, Mark Coleman. - NJPW Best of the Super Junior '00 (May/June) = Fujita competed in the league, which was won by Tatsuhito Takaiwa. - Pride Ten (August 27, '00) = Fujita took down Ken Shamrock in the 1st Round. - Pride Twelve (December 23, '00) = Fujita won, via Decision, over Gilbert Yvel. - NJPW Strong Style '01 (April 9) = Fujita won the IWGP Heavyweight Title, beating Scott Norton. - Pride Fourteen (May 27, '01) = Fujita, as the NJPW IWGP Heavyweight Champion, defeated Yoshihiro Takayama in the 2nd Round. - NJPW Budokan Hall (June 6, '01) = Fujita kept the IWGP Heavyweight Strap, taking down Yuji Nagata. - NJPW Dome Quake (July 20, '01) = In a dark match, Fujita retained the IWGP Heavyweight Title, winning over Don Frye. - NJPW Indicate of Next (October 8, '01) = Fujita won a "Vale Tudo" Match over Kensuke Sasaki. - UFO Legend (August 8, '02) = Fujita forced Tadao Yasuda to submit in the 1st Round. - NJPW Budokan Hall (August 29, '02) = Fujita was pinned by Yoshihiro Takayama in the first round of the NWF Title Tournament. Takayama went on to win the tournament. - NJPW Spiral (October 14, '02) = Fujita lost to the IWGP Heavyweight Champion, Yuji Nagata. - NJPW Ultimate Crush (May 2, '03) = Fujita won a "Vale Tudo" Match over Manabu Nakanishi. - Pride Twenty-Six (June 8, '03) = Fujita was forced to submit to Fedor Emelianenko in the 1st Round. - NJPW Ultimate Crush II (October 13, '03) = Fujita, Shinsuke Nakamura, Bob Sapp, Minoru Suzuki, & Yoshihiro Takayama won an "Elimination" Match over Yuji Nagata, Manabu Nakanishi, Seiji Sakaguchi, Hiroshi Tanahashi, & Hiroyoshi Tenzan. - K-1 Romanex (May 22, '04) = Fujita KO'ed Bob Sapp in the 1st Round. - K-1 Dynamite! '04 (December 31) = Fujita won an "MMA" Match in the 1st Round over Karam Ibrahim. - NJPW Pro Wrestlers Be Strongest (October 9, '04) = Fujita lost the IWGP Heavyweight Title to Kensuke Sasaki. - NJPW Toukon Festival (November 13, '04) = Fujita & Kendo Kashin defeated Shinsuke Nakamura & Manabu Nakanishi. - NJPW Sumo Hall (August 13, '05) = Fujita pinned Shinsuke Nakamura. - NJPW Sumo Hall (August 14, '05) = Fujita took down Toshiaki Kawada, then lost in the finals of the '05 G-1 Climax League to Masahiro Chono. - NJPW Toukon Souzou New Chapter (October 8, '05) = Fujita lost a "Triple Threat" Match to Brock Lesnar, who won the IWGP Heavyweight Title. Masa Chono was the other participant. - Pride Total Elimination Absolute (May 5, '06) = Fujita KO'ed James Thompson in the first round. 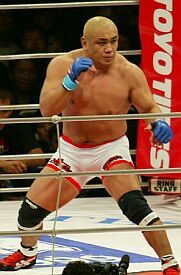 - Pride Critical Countdown Absolute (July 1, '06) = Fujita lost in the 1st Round to Wanderlei Silva. - Pride Shockwave '06 (December 31) = Fujita forced Eldari Kurtanidze to submit in the 1st Round. - Pride Thirty-Four: Kamikaze (April 8, '07) = Fujita was forced to submit in the 1st Round to Jeff Monson.